Two weeks ago, my sister came over for a long weekend to visit me in Brussels and I wanted to cook something nice. Because the asparagus was everywhere by that time, I thought it would be nice to prepare one of my favorite risottos. But as usual, our program was supercharged and we spent much time outside – on Saturday, we did a chocolate workshop with Laurent Gerbaud in Brussels and on Sunday, we went to the Netherlands. The rest of the time, we ate outside or made some quick and easy dishes or salads to enjoy the nice weather outside. 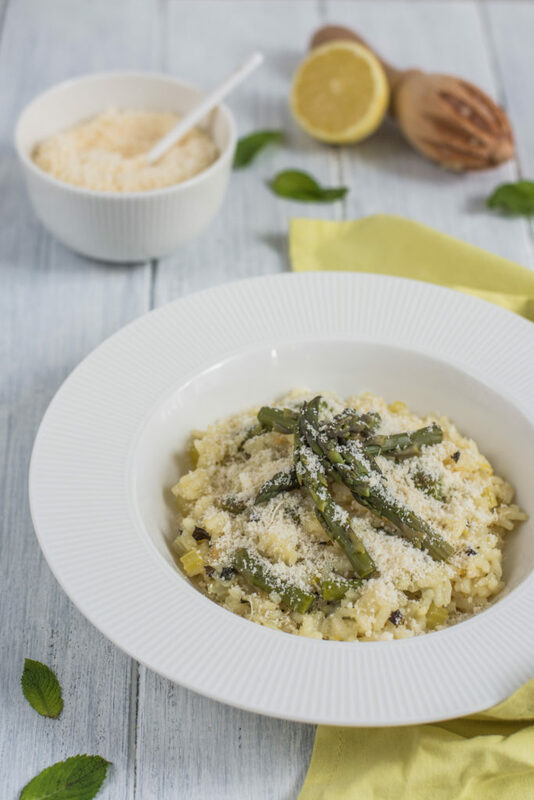 But because I already had all the ingredients at home, I prepared it last weekend so that I could make some pictures and share this Lemony Asparagus Risotto recipe with you guys here on the blog! 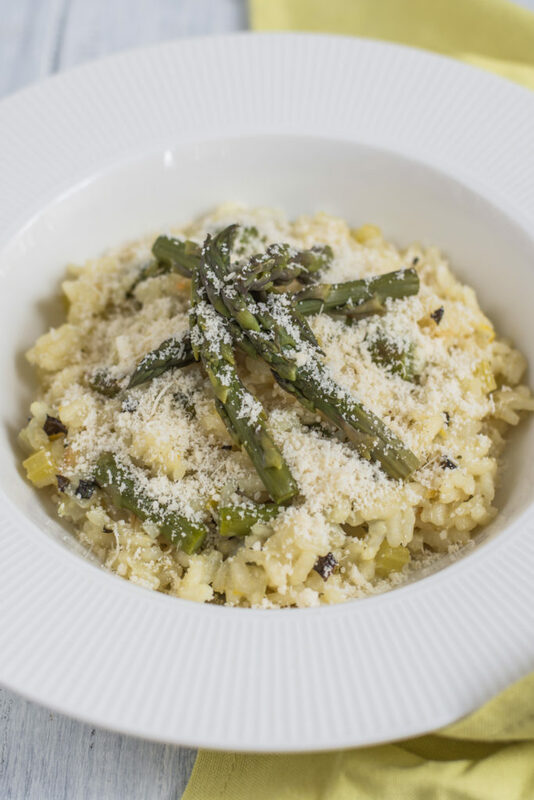 Lemony asparagus risotto belongs not only to my favorite risottos but also to my favorite spring dishes. It is creamy but not too much buttery, with a delicate and specific flavor of asparagus. 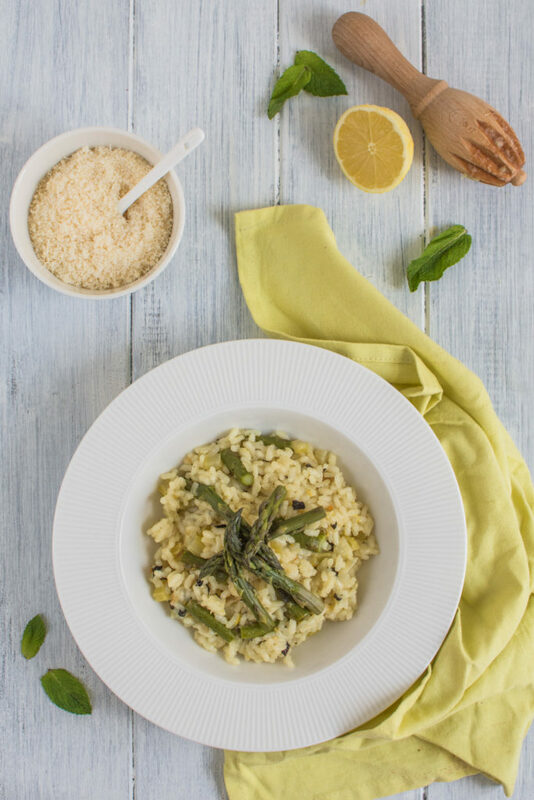 Lemon juice and zest together with mint leaves give the risotto a fresh touch. It has been a while since I have been thinking about posting the recipe, so I am happy that I finally made the effort and you can now enjoy this delicious meal too! If you make it, please do let me know how did it turn out and how did you like it! Or if you have any other suggestions, do not hesitate to leave a comment too. Looking forward to your feedback! 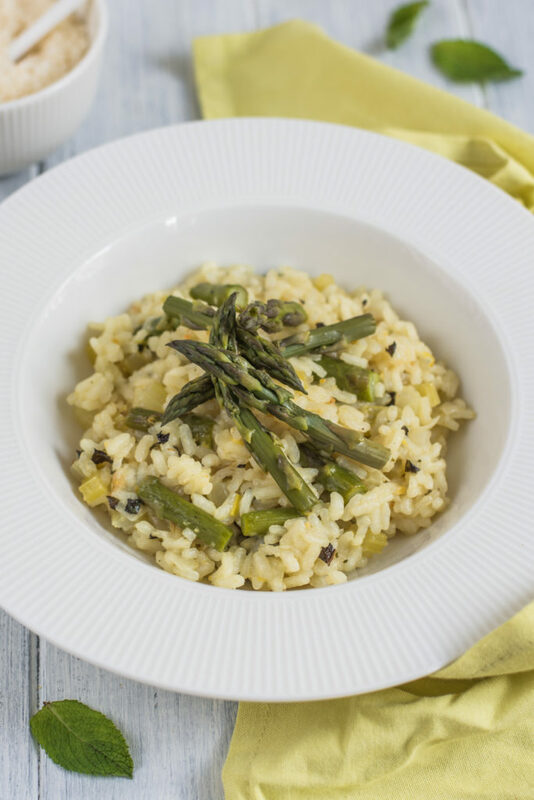 A delicious risotto with delicate flavour of asparagus and freshness of lemon and mint. Cut the trimmed asparagus into smaller pieces, then cook it in a boiling water for 3 minutes. Remove from the water and allow to drain, leaving separately the chopped stalks and tips. Bring the stock to simmer in a saucepan. Grate the lemon zest and juice the lemon. Chop the mint leaves. Heat the olive oil in a large saucepan over a medium heat and cook the onion and celery, stirring frequently, until soft for about 5 minutes. Add the rice and increase the heat, continue to cook, stirring, for another 2-3 minutes. Then add the wine, stirring frequently, until evaporates. Add a ladle of the warm vegetable stock to the rice and cook, stirring, until absorbed. Add another ladle of the stock, stir and cook until absorbed and repeat until you use all the vegetable stock, until the risotto has a creamy consistency. Add butter with the last ladle of stock so that it can dissolve well. Remove from heat and stir in the asparagus stalks, lemon juice and zest, mint leaves and season with salt and pepper. 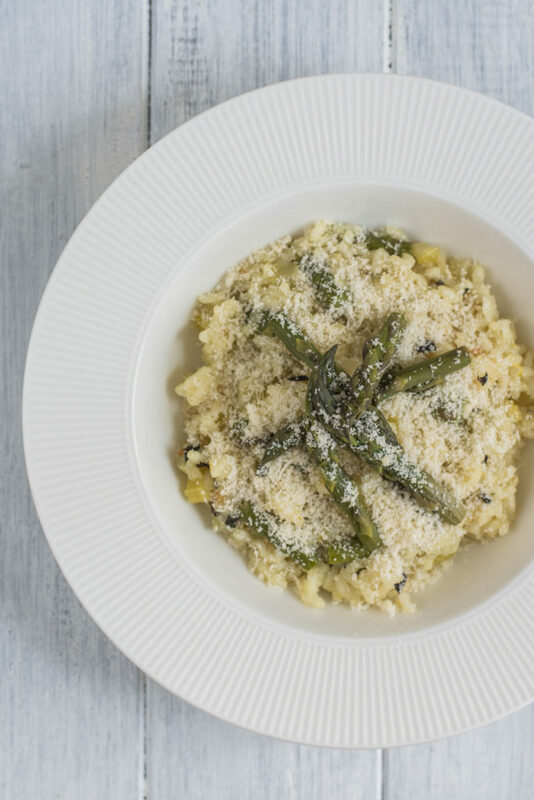 Serve warm decorated with the asparagus tips and Parmigiano-Reggiano. This looks delicious. Very summery. Yummy, this is tasty, I love the recipe idea.